The Russian River is a primary water supply for Mendocino, Sonoma and Marin counties. The Water Agency is a wholesale supplier of water from the Russian River to urban areas in Sonoma and Marin counties, serving over 600,000 people. In addition, the Russian River and adjacent alluvial aquifers provide the water supply for several cities, communities, rural residents, and agriculture in the watershed. The Russian River and tributaries also support three salmonid species listed under the state and federal Endangered Species Act. 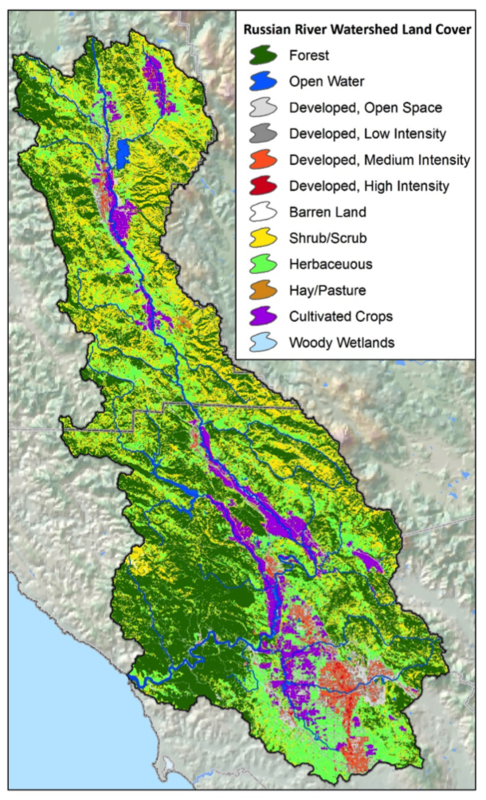 A brief description of key characteristics of the Russian River watershed are provided here for context, including predominant weather conditions controlling the hydrometeorology, as well as the physiology, hydrology and key water management facilities and operations. The Russian River watershed is influenced by its proximity to the Pacific Ocean and its year is divided into wet and dry seasons. About 93 percent of the annual precipitation normally falls from October to May. Winters are cool, and below-freezing temperatures seldom occur and snow does not normally accumulate anywhere in the watershed for more than a short period. Average annual precipitation ranges from about 35 to 80 inches, with amounts generally increasing with elevation. Much of this rain occurs in just a few atmospheric river storms (AR) each year. ARs provide 40-50% of total rainfall (Dettinger et al. 2011; Ralph et al. 2013). These highly productive AR storms have been key to ending droughts (in wet seasons) in the area since 1950 (i.e., 60% of droughts were “busted” by ARs; Dettinger 2013). Although ARs beneficially provide a large share of the overall water resources, they can cause flooding when they are strong and stall over the area. Historically, 87% of all (39) declared floods since 1948 were driven by winter ARs (Ralph et al. 2006). Thus the water resources, floods and droughts of the Russian River basin are closely, but complexly connected; historically in a majority of cases, the connection has been in the form of a land-falling AR. 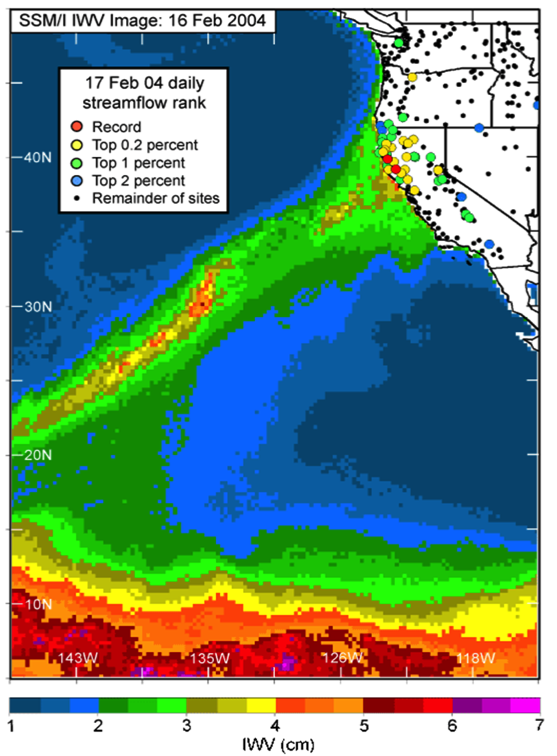 Drought in Northern California is not uncommon (Dettinger et al. 2011), but the high pressure blocks that are involved derive from multiple forms of climate variation and atmospheric circulation, and may occur within both phases of ENSO (el Nino-Southern Oscillation) (e.g. Namias 1978; Dettinger et al. 1998; Cayan et al. 1998). AR events, which may prevent or defeat prolonged dry spells (Dettinger 2013) can be influenced by phases of ENSO. The Russian River watershed drains an area of 1,485 square miles that includes much of Sonoma and Mendocino counties. The watershed is located within the North Coast Ranges geomorphic province of California. It is 110 miles in length and flows generally southward and then westward to the discharge point at the Pacific Ocean, 20 miles west of Santa Rosa. The river has several tributaries of varying size that contribute flow, primarily during the winter and spring. The watershed is bounded by the coastal mountain ranges with elevations ranging up to 3,500 feet above sea level. Land use in the watershed is generally rural agricultural with several urban/residential areas as shown to the left. The Russian River exhibits “flashy” hydrology with generally lower summer and fall flows (below 200 cubic feet per second) primarily from reservoir releases and elevated natural flow during the wet season (typically November through April) punctuated by rapidly increasing short-term high flow events resulting from extreme storms events, mostly ARs. The flood of record occurred in February, 1986, when flows at Guerneville reached 102,000 cubic feet per second. Since the completion of Coyote Valley Dam in 1958, the upper Russian River has reached flood stage at the Hopland discharge gage nine times (16% of the years) and at the Healdsburg gage six times (11% of the years). Since the completion of Warm Springs Dam in 1983 the Russian River at the Guerneville gage in the lower river has reached flood stage 12 times (39% of the years). Two federal projects impound water in the Russian River watershed: the Coyote Valley Dam (CVD) on the Russian River (forming Lake Mendocino), and the Warm Springs Dam on Dry Creek (a tributary of the Russian River) in Sonoma County (forming Lake Sonoma). Because the Water Agency was the local sponsor for the dams and partially financed their construction, it has the right to control releases from the water supply pools of both reservoirs. PG&E’s Potter Valley Project, discussed below, imports water from the Eel River into the Russian River watershed. Lake Sonoma and Lake Mendocino and their associated facilities, collectively referred to as the Russian River Project, are operated in accordance with criteria established by the State Water Resource Control Board’s Decision 1610, which established minimum instream flow requirements for Dry Creek and the Russian River. The Water Agency makes no diversions from the Russian River between Lake Mendocino and the Russian River’s confluence with Dry Creek, but does authorize diversions by others under its water rights permits. Flood management releases from both reservoirs are controlled by the USACE. The Water Agency diverts water from the Russian and conveys the water via its transmission system to its customers. PG&E’s PVP, constructed in 1908, diverts water from the Eel River into the Russian River watershed. Water is stored in Lake Pillsbury (constructed for the PVP in 1922) on the Eel River, then moves through a diversion tunnel to the Potter Valley powerhouse in the Russian River watershed. The water is discharged from the powerhouse into a canal from which the Potter Valley Irrigation District diverts water. The water then flows into the East Fork of the Russian River to Lake Mendocino. PVP diversions are regulated by a license issued to PG&E by the Federal Energy Regulatory Commission (FERC) and serve multiple purposes, including power generation, Potter Valley agricultural irrigation, and minimum instream flow requirements in the East Fork of the Russian River. PG&E’s license was amended in 2004, resulting in significant reductions to PVP diversions starting in 2006, resulting in lower inflow to Lake Mendocino. CVD impounds water, forming Lake Mendocino on the East Fork of the Russian River. Lake Mendocino has operated since 1959 and captures water from two sources: (1) runoff from a drainage area of approximately 105 square miles and (2) Eel River water diverted by PG&E’s PVP. Natural drainage and stream flow (as opposed to reservoir releases) contribute the majority of the Russian River flow downstream of CVD and above Dry Creek during the rainy season (November through April). In contrast, during the drier months of May through October, water released from Lake Mendocino accounts for most of the water in the Russian River upstream of Dry Creek. 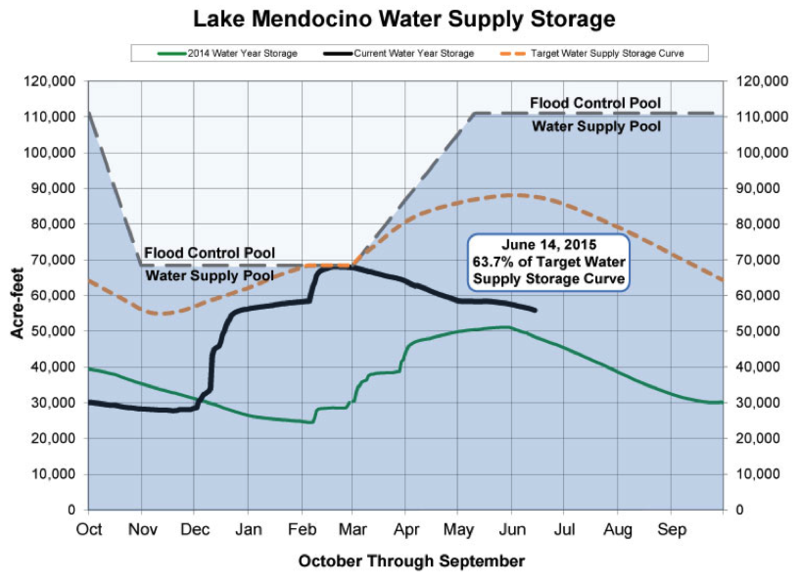 The Water Agency and the Mendocino Flood Control District have water right permits authorizing storage up to the design capacity of 122,500 acre-feet per year (ac-ft/yr) in the reservoir. The water supply pool capacity of Lake Mendocino is currently 68,400 ac-ft. The Water Agency controls releases from the water supply pool in Lake Mendocino. However, the USACE manages flood control releases when the water level exceeds the top of the water supply pool elevation. The USACE allows the Water Agency to encroach into the flood pool in the spring so that the summer water supply pool can be increased to 111,000 ac-ft.
Water stored behind Warm Springs Dam, completed in 1983, forms Lake Sonoma. It captures runoff from a drainage area of approximately 130 square miles on Dry Creek, a major tributary of the Russian River. It has a design capacity of 381,000 ac-ft at the spillway crest and a design water supply pool capacity of 245,000 acre-feet. The Water Agency controls water supply releases from Lake Sonoma and the USACE manages flood control releases. Releases from the dam flow into Dry Creek, which meets the Russian River 14 miles downstream. Natural drainage and stream flow (as opposed to reservoir releases) contribute the majority of the Dry Creek flow downstream of Warm Springs Dam during the rainy season. During the dry season, reservoir releases contribute the majority of the flow in Dry Creek. Such reservoir discharges supply flow to meet minimum instream flow requirements and municipal, domestic, and industrial demands in the lower Russian River area. Water released from Lake Sonoma and runoff from other tributaries contribute to meeting these demands. There are multiple, significant challenges associated with the operation of the Coyote Valley Dam (CVD). A key challenge is illustrated to the right. It shows how, avearged over the water years from 2004 to 2014 (blue line), the Lake Mendocino reservoir has not been able to refill in the spring. Sonoma Water is the local sponsor for Lake Mendocino and controls and coordinates water supply releases from the CVD. There are several water supply challenges, including minimal coordination with people who use water downstream; a federal biological opinion that requires flow changes; an out-of-date rule curve for determining flows; and reduced inflows from the Eel River watershed. maintain minimum in-stream flows in the upper river to its confluence with Dry Creek. The hydrologic year type for the Russian River system is based on cumulative inflow into Lake Pillsbury, which is located on the upper Eel River and was formed in 1921 by the construction of Scott Dam (Figure 7). This hydrologic index is not located in the Russian River watershed and reflects Lake Mendocino’s dependence of PG&E’s Potter Valley Hydroelectric Project (PVP). Lake Pillsbury is part of the PVP, 9.4 megawatt storage and diversion project, that has been in operation for more than 100 years. PG&E’s operation of the project results in an inter-basin transfer of water from the upper Eel River into the East Branch Russian River across a natural divide. CVD operations are governed by the Water Control Manual that dictates ranges of release flows depending on pool level, non-regulated flows in the Russian, damaging flood stages downstream of the dam and on current releases. The rate-of-change (ramping) standards were developed as part of consultations with NMFS and from geotechnical considerations to prevent stranding fish and to minimize bank damage. In general, the operation is designed to store water during a flood event, then release soon thereafter to create storage space for another potential event. Seasonal differences in required flood space are the result of nearly 100 years of hydromet data, and are based on typical weather patterns — wet during the winter, dry otherwise. Since much of the basin is not regulated by dam operations, the Water Control Manual is designed to prevent flooding when possible in the Hopland and Guerneville areas, and in concert with Warm Springs dam operations. The National Marine Fisheries Service (NMFS) has issued two biological opinions that pertain to water storage in the Russian River: (1) the PVP Biological Opinion in 2002 (Eel and Russian rivers transbasin diversion); and (2) the Russian River Biological Opinion in 2008. Project elements addressed in the Russian River Biological Opinion include operations and water supply releases at Warm Springs and CVD, flood control operations, channel maintenance (Water Agency and Mendocino Flood Control Agency), estuary/lagoon management, fish hatchery operations at Don Clausen Fish Hatchery and Coyote Valley Fish Facility, and other Water Agency diversion facilities and operations. Specific to Lake Mendocino and CVD operations, the Russian River Biological Opinion identifies three primary project elements impacting fisheries: (1) higher summer flows/velocity from CVD releases effecting juvenile steelhead rearing habitat in the upper main stem Russian River (modify Decision 1610); (2) chronic turbidity issues associated with Lake Mendocino discharge; and (3) water discharge ramping rates (up/down) and annual dam inspections (suspended releases to the East Branch Russian River).